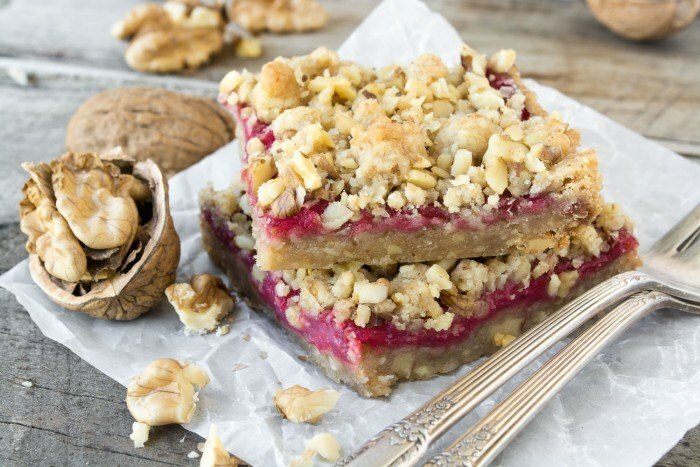 Cranberry Walnut Shortbread Bars feature a buttery walnut shortbread crumble crust filled with a gorgeous tangy cranberry curd! lightly grease and line a 9x9 square baking pan with a parchment 'sling' so you will be able to life the bars out after baking to cut them cleanly. Put the walnuts in a food processor and pulse several times until they are finely chopped. Divide the ground nuts in half, and set aside. Put the flour and sugars in the processor and pulse to combine. Add in the soft butter, in pieces, as well as as HALF of the nuts. Process briefly to bring the dough together, until there is no more dry flour left. The mixture will have a coarse crumble texture. Measure out 1/2 cup of the dough and set it aside for the topping. Pat the rest of the dough into the bottom of the pan. Use your fingers to distribute the dough evenly. Cover the entire surface of the bottom...if you need a little extra take it from the reserved dough. Mix the reserved dough with the nuts, using your fingers to make a coarse crumble. Spread the cranberry curd out over the warm crust. Be careful, the dough will be soft. Sprinkle the crumble topping evenly over the top. If you like you can sprinkle a few more finely chopped walnuts over that. Bake for 20 minutes. Let cool before cutting.